If you like to eat, chances are you like to drink (read: a lot of you are freakin’ lushes), so every week our Happy Hour Correspondent “Mamacita” will post about a different bar in Midtown that fits the Midtown Lunch mentality: unhealthy food, not lame (unless it’s lame in a cool way), and most importantly… cheap. 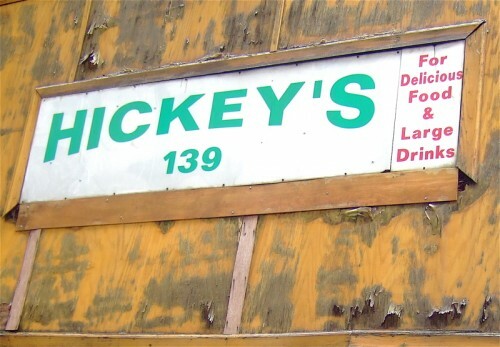 Ever heard of a bar called Hickey’s? No? It’s not a seedy pick up joint for promiscuous playboys, quite the opposite in fact. 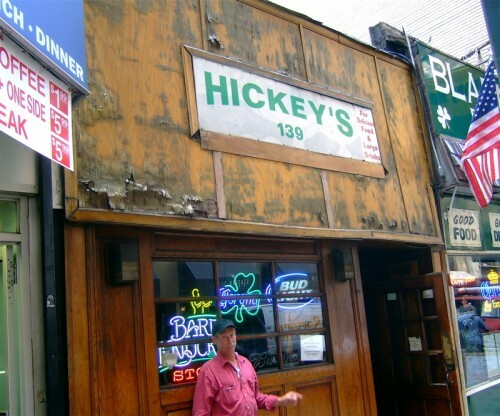 Hickey’s happens to be a 43 year old pub that has managed to be one of the few dive bars in midtown that has yet to be overtaken with hipsters and pretentious martini sippers looking for an ironic new hangout. 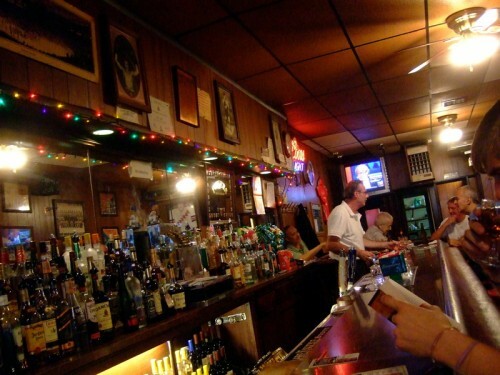 Hickey’s has no “scene” and is not the place to take a group of friends to party… most come here to forget. It is a hide away and a distraction. The walls are lined with portraits of pugilists, baseball players and Rangers hockey memorabilia. 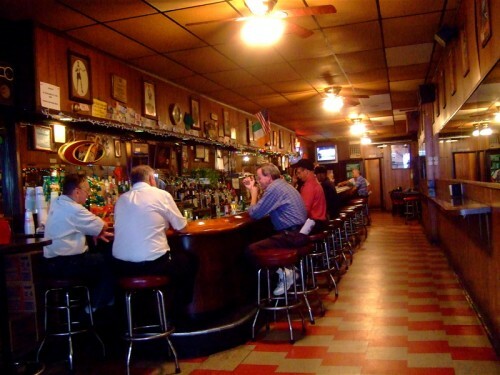 Hickey’s is a haven from the bright bustling crowds of Broadway for the cirrhosis addled looking for a drink. Despite what the venerable sign advertises outside; drinks are not large and no food is offered expect for chips and nuts. The TVs are not high-definition flat panels, instead there are big tube bastards that flicker all the games just like a funky dive should. Barry the bartender is from the Emerald Isle and a constant figure throughout the week. His love of sports is evidently not from watching them on TV, Barry can tell you stories of boxing matches he’s been to. Looking for weekly cask ales? No. Artisanal cocktails? No. Happy hour? No. You will not find these at Hickey’s. 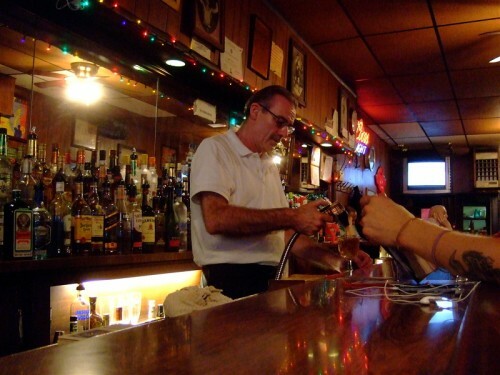 What you will find is Bud and Bud light on tap and a measly selection of bottled beers like Becks, Bud, and Amstel Light that line the bar like fallen soldiers. My Wild Turkey with soda was $5, same for all well drinks. They come in a dainty faux crystal glass and are sadly small, but this isn’t the place to pound one down. This is a slow-drink movement. When you saddle up to that stool you’re in for the long haul. If you haven’t guessed, the crowd tends to skew towards the Abe Simpson kind. 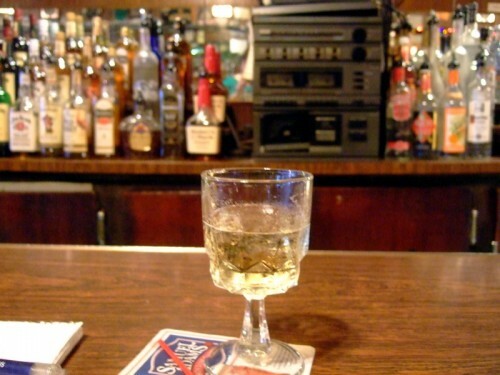 If you are lucky you’ll still find the owner at the end of the bar, pale as a ghost, inhaling a gray cloud of nicotine. His comrades and Budweiser bottles all huddled around him. These gramps won’t look you in the eye, but if you bring up the right topic they will lean in to share a story or joke or two. There is an internet jukebox by the front, but I doubt they’d look kindly on you if you browsed it. Better off leaving the music to the aging cassette tape player behind the bar. Last time I was there the only other person at the bar not eligible for Social Security was a guy drinking rum doubles and reading a book about Jim Morrison. He engaged the bartender in conversation and it won him a buyback. Despite being a nondescript hangout a few frequent fliers have accidentally caught on to its lived in charm. An older couple vacationing at a hotel nearby left promising to come back again tomorrow. I met a divorcee from San Diego that made this his pit stop on every trip to see his daughter for the past 4 years. When I asked him why have you been coming back for all this time he said, “for the atmosphere, of course.” Yes, because Hickey’s is hidden, out of place, and soon to be part of lost NY. In the end, Hickey’s shows that sometimes the best place to find yourself is where no one is looking. Posted by Mamacita at 3:00 pm, August 27th, 2010 under Midtown Happy Hour. My god! What a hell hole. I must go. I also like it. It is a bit reminiscent of a few of my wife’s and my favorite pubs in Ireland and Scotland. This looks nothing like a pub in Ireland. Nice write-up, Mama. Poetic, and in the Zach tradition of Boldly Go. I love places like this but I can’t stand Bud. 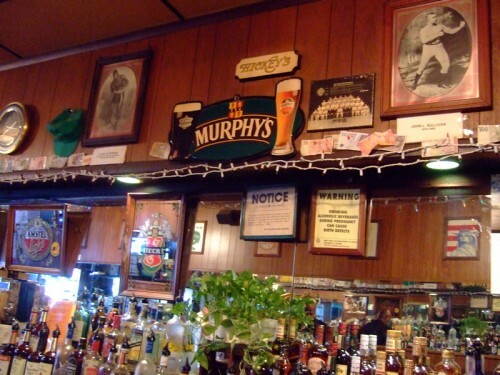 Maybe they have Murphy’s stout seeing as they have a sign for it on the wall?